It's said that every picture tells a story. One that greeted patients walking into Mayo Clinic Hospital, Methodist Campus, back in 1966 was one many patients could relate to. The picture — actually a mosaic titled "Renewal of Life" — depicted the biblical story of Job, a story of suffering, faith and perseverance. The piece, a gift from the hospital's auxiliary, covered an entire wall and was made of marble from the same quarry in Italy where Michelangelo obtained material for his sculptures. But as a certain noteworthy Minnesotan has noted, the times they are a-changin'. And they were a few years ago as well. A new pharmacy was built to better serve the hospital's patients. The construction required the mosaic to be covered with a protective wall, which is how it remained for more than a decade. But while it may have been out of sight, it was never out of mind. Especially among the auxiliary members who had helped bring it to the hospital’s patients. 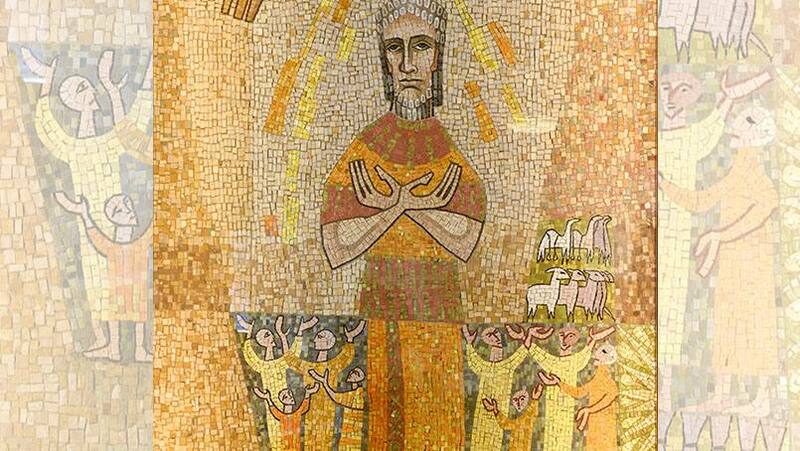 "It was a long-held desire of Mayo Clinic volunteers to make the mosaic visible again," says Matt Dacy. Dacy, director of Mayo Clinic Heritage Hall, tells us that desire gained traction as its advocates realized a golden opportunity was approaching: the hospital's 50th anniversary. Soon, Amy Williams, M.D., and Ken Ackerman, both members of Mayo’s Hospital Practice Subcommittee, were on board. Dave Eide and Sharon Erdman from Mayo's Facilities Project Services were approached to spearhead the project that would have part of the mosaic restored. And on Oct. 3, during Mayo Clinic's Heritage Days events, a portion of the mosaic was revealed as a museum-quality display. Among those on hand for the reveal were Gerald Needham, Ph.D., and Billie Needham, his wife, who both were there for the hospital's opening half a century ago. Dr. Needham was an early leader of what was then known as Rochester Methodist Hospital, and Billie Needham was a charter member of the hospital’s auxiliary. So it seemed only fitting that they should be among those to welcome the mosaic's return. Billie got to do the honors, pulling back the curtain covering the restored panel. We're told the unveiling of the panel, which depicts Job expressing gratitude for the blessings of life, brought some in attendance (we're not naming names) to tears. If you like what you see in the mosaic, take a look at more examples of the art of medicine at Mayo Clinic, recently highlighted by Minnesota Public Radio. Then, paint us a (verbal) picture by leaving a comment below. You can use the social media tools to share this story with others. Where is the rest of the mural?